Simon Ponsford (countertenor) recently graduated with an MA Distinction from the Royal Academy of Music, where he was also awarded the S & M Eyres Wilson Scholarship and a Diploma of the Royal Academy of Music for outstanding performance. At the RAM he studied with Michael Chance and Ian Partridge, and took part in masterclasses given by Ann Murray and Helmut Deutsch. He is also a Lay Vicar in the choir of Westminster Abbey, alongside which he regularly appears as a recitalist and soloist. Simon began his musical training as a chorister in Gloucester Cathedral Choir, before returning to Gloucester as a choral scholar. 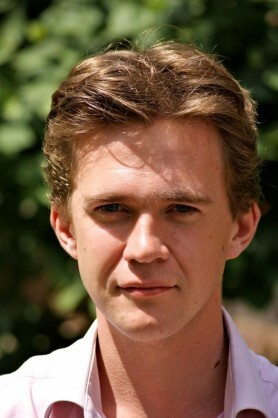 In 2008, he graduated from King’s College, Cambridge, with a BA in English Literature following two years as a member of King's College Choir. Simon has sung with many professional choirs including Polyphony, Tenebrae and the Monteverdi Choir, and is a founder member of the Platinum Consort. Recent solo highlights include Handel’s Jephtha (Whitehall Choir, St John’s Smith Square), Bach’s Weihnachts-Oratorium (Platinum Consort, King’s Place), Handel's Messiah (English Symphony Orchestra) and Bach's Matthäus-Passion (Carshalton Choral Society). Simon has recently given recitals of Schubert’s Winterreise with pianist Nick Fletcher in Gloucester, Windsor and Edinburgh, and recitals of early English songs in across the UK and France. He has also recently had a CD of Elizabethan and Jacobean songs released by Nimbus Records. Simon’s opera roles include David in Samuel Hogarth’s David and Goliath (CUOS), Athamas in Handel’s Semele (Benslow Baroque Opera), the countertenor roles in Purcell’s The Fairy Queen (Benslow Baroque Opera), Narciso in Handel’s Agrippina, Eustazio in Handel’s Rinaldo, Ruggiero in Handel’s Alcina and the Refugee in Jonathan Dove’s Flight (RAM Opera Scenes).